The Bottom Line: Live worship recordings span the gamut from low-tech and low-emotion to state-of-the-art and high energy. Depending on what draws your spirit to worship, either can be just as moving and just as worshipful as the other. Hope is one of those live worship recordings that is sure to resonate with anyone who desires to praise God, to see His glory inhabit the adoration of those who worship. It's an energetic, heart-stirring means of connecting with God, with hope-filled songs you'll go back to time and time again to express your love for Him. Featuring: "Better Than Life," "Glory," "Ever Living God," "Need You Here," "My Hope," "Still," "Angels," "Can't Stop Praising," "You Are / You Are Lord," "Here I Am To Worship / Call" and "Highest." Bonus CD includes: "Song Of Freedom," "Shout Your Fame," "Exceeding Joy," "King Of Love," "To The Ends Of The Earth," "Free" and "Highest" (reprise). Special Offer! Save up to $8 on sets! 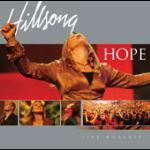 Order Hope CD/Songbook/DVD combo sets and add Hillsong Music's best- album Blessed featuring 14 more top worship songs!